Iraq entered the 2007 Asian Cup hoping to reach the quarter-finals but ended up coming away with the trophy and the crown as champions of Asia in what is undoubtedly the country's finest ever sporting achievement. Iraq started the tournament slowly, coming away with a 1-1 draw against co-hosts Thailand. Thailand scored first with a controversial penalty after six minutes but Iraq, who dominated the first-half, equalised through the captain Younis Mahmoud on 32 minutes. It was only after the second game that Iraq started to believe that they could achieve something special. They beat tournament favourites Australia convincingly with a 3-1 win. Nashat Akram put Iraq one-nil up on 22 minutes with a 40 yard free-kick but Australia equalised four minutes after the break through Newcastle's Mark Viduka. Iraq then shocked the team of Premier League stars including Cahill, Kewell, Emerton, Schwarzer, Niell and Viduka by running away with the game. Hawar Mulla Mohammed put the Iraqis back in front on 60 minutes before Karrar Jassim completed the rout on 86 minutes. After this unexpected result, Iraq only needed a draw to progress to the quarter-finals which they battled to achieve, holding Oman to a 0-0 draw. The eventual champions allowed Oman possession of the ball during the game and in the end came out with the draw they needed. Iraq then had to play co-hosts Vietnam in the quarter-finals. Many people thought Iraq would lose as the hosts usually reach the semi's, but Iraq ignored history by winning 2-0. Younis Mahmoud score a brace with goals on two minutes and 65 minutes and were through to the semi-final, a great achievement in itself. But Iraq were not going to stop there. In the semi-finals, Iraq faced Asian giants South Korea. They had beaten them in the Asian Games semi-final and did the same here. The game ended goalless and Iraqi 'keeper Noor Sabri was the hero in the shootout as Iraq won 4-3 on on penalties to advance to their first ever Asian Cup final. Iraq were shocking the continent and even the world but so were a youthful Saudi Arabian side (boasting Asia's player of the year Yasser Al-Qhatani) who they had to defeat in the final to secure their first ever Asian Cup title and bring joy to a land where that emotion is a rare luxury. Saudi Arabia were strong favourites after beating Japan in the semi-final. But Iraq recorded their fourth clean sheet in a row and after joint top scorer and MVP Younis Mahmoud put them one up on 71 minutes they had little problem holding onto that lead. They dominated proceedings and could have won by three or four goals. But one goal was enough to secure Iraq their first ever Asian Cup triumph in what was undoubtedly the greatest giant-killing ever in an international tournament. 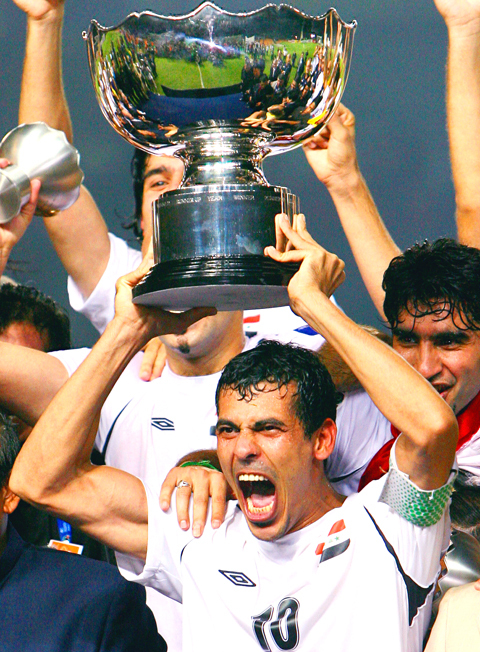 Younis Mahmoud proudly held the Asian Cup aloft and Iraq were the champions.